There are actually five political groups/parties in America. They are Democrat, Republican, Libertarian, Green party, and Independents. Only two of these, Democrat and Republican, actually function as effective political parties but the “Independents” do influence elections, especially Presidential elections. If you are not registered as a Democrat or Republican you cannot vote in some primary elections (in states with closed primaries) and can be limited in your ability to vote in primary runoff elections. This is why so many Americans are registered as Democrats or Republicans when they do not completely agree with their registered party’s official platform. The Republicans “claim” to be a pro Constitution, pro capitalism, free market, smaller government, fiscally conservative party. This is “mostly right”. It would be “right” if it were not for much of the party leadership becoming “rinos” (Republican in name only) over the years due to a lack of term limits in Washington and too much “special interest” influence. Originally the Democrats were the party of slave owners and pro segregation. The leaders of the KKK were Democrats (check out deceased Senator Byrd’s history). The party evolved over time and declared it was the party of the “working man” and maintained widespread support in the South and heavily blue collar (pro union) areas of the country. The Democrat party has more “straight party line” voters than any other party in America (they vote only for Democrats or democratic ballot initiatives no matter who or what they are). They were known as “yellow dog Democrats” in the South (they would vote for a yellow dog if it was on the Democratic ballot). The number of “straight party line Democrats” has dropped dramatically in the last 20 years as it became increasingly obvious that the party had been totally taken over by liberals/progressives (the Left). In recent years it became obvious that it no longer resembled the Democratic Party from the past. Zell Miller, a former governor of Georgia, whose family was a multi-generation “yellow dog Democrat” family published a book in 2003, “A National Party No More” detailing the destruction of the Democratic Party. This is now the political party that violently demands that nothing but their liberal/progressive agenda is acceptable in America. The Libertarian party is basically a small government, live and let live party with limited influence in American politics. If they vote, other than for a Libertarian candidate or ballot initiative, they tend to vote Republican more than any other party, depending on the candidate or ballot issue. The Green party is the most “extreme” party in America. They have the most extreme environmental, animal rights and human rights views imaginable and are obsessed with the “One World Order” movement. If they vote, other than for a Green Party candidate or ballot initiative, they usually vote Democrat. The Independents are not really a party. These are the people who do not consider themselves as a member of an established political party. If they vote it is for specific issues or candidates who they can agree with. These are the voters that candidates specifically target in close elections. As noted above, there are four organized political parties in America plus the Independents, but we basically function as a two party system at the polls, Democratic or Republican. Unfortunately one of those parties, the Democratic Party, has become so liberal/progressive that it only sees “their way” or “any other way”, with “any other way” being totally wrong and unacceptable to them. During the recent 2016 Presidential election cycle the Left openly labeled everyone that did not totally agree with their views and support Hillary as racist, misogynist, xenophobic, homophobic, white supremacist, and fascist. This unyielding position from the left effectively puts everyone in America into an inflexible two party, us or them system, which is not the way it is supposed to be in America. 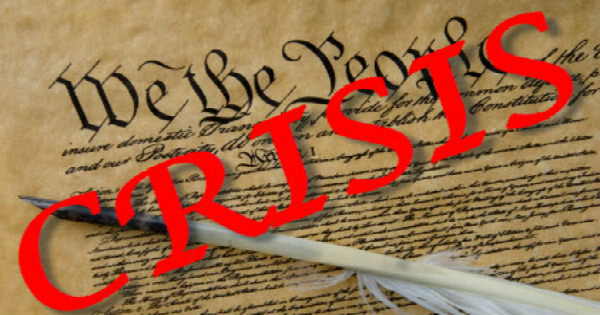 Since the November election the Left’s obsession with forcing their views on everyone in America has progressed to the point that we are on the verge of a Constitutional crisis. Every day now I see and hear things that make it clear to me that the Left does not believe in the U.S. Constitution and is increasingly willing to resort to anarchy to destroy it. America must continue to be a Constitutional Republic with the “Rule of Law”, as specifically spelled out in our Constitution, enforced or America will cease to exist! As I said in closing some of my recent articles, getting President Trump elected was only the beginning. We must continue to support him, his staff and the actual Conservatives who are in Washington so President Trump can continue to do what he set out to do and pledged to do. Stay informed and involved. Communicate with your elected representatives and demand changes regarding term limits, open public records, transparency in all government activities, fiscal responsibility, and reasonable performance standards for all government employees! Session's Mistake is Giving an Inch to America's Enemy....the Democrats!Breaking! Obama Crime Syndicate Extorted Cash for Friends from Department of Justice Slush Fund!